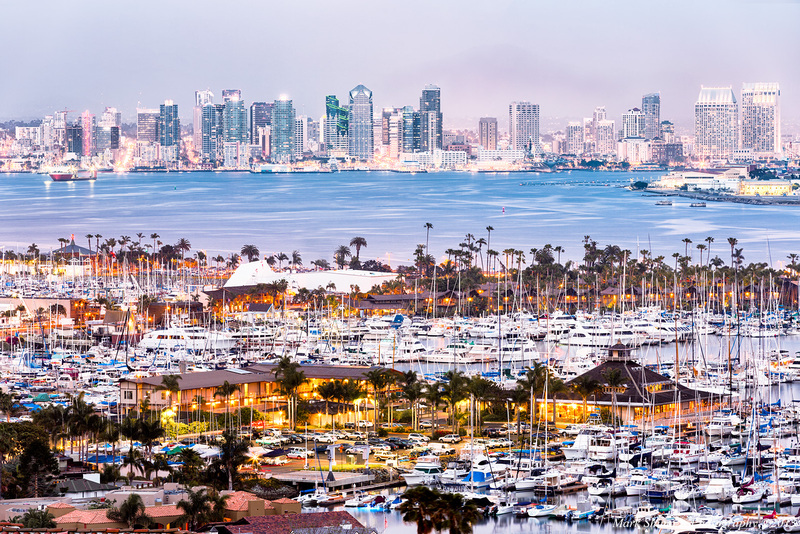 I have wanted to take this classic shot of the San Diego harbor and skyline ever since my wife gave me the excellent book PhotoSecrets San Diego: The Best Sights and How To Photograph Them for Christmas. Although the conditions were not ideal since there was atmospheric haze in the air and thus reducing visibility, I was pleased with how the above shot turned out. I arrived around 40 minutes prior to sunset and took photos all the way until about 30 minutes after sunset. The early photos were not usable due to the haze obscuring the city. It was only when the lights of the buildings started turning on that I got any definition in the skyline. I set up midway up Lucinda Street in Point Loma and pointed my camera due east towards Downtown San Diego. The harbor in the foreground is around 1/4 mile down the hill and the small land mass you can see in the midground camera right is North Island Naval Air Station, around 2 1/2 miles out. Downtown San Diego is around 4 miles east of where I was standing and you can barely make out the mountains through the haze which are around 16 miles out. The shot was made around 25 minutes after sunset where the city lights balanced the remaining light in the sky. I used f/9 since the closest object was around 200 feet away and this aperture is where most lenses are their sharpest. I plan to go back and retake this shot when the conditions are more favorable. I have read that the winter months offer the clearest days, so I probably won’t re-attempt this shot until then. On a side note, I receive fairly regular Google search hits to my blog, presumably from people who want to know what there is to photograph in the various locations I have shot. With this in mind, I have started to include geographic coordinates so that others can get similar shots to the ones I have posted if they desire. I was inspired to do this by another local San Diego photographer, award winning Phillip Colla who has been featured and published in top tier nature and wildlife programs and magazines. Phillip’s photos are not only inspirational, but he has also been a terrific fellow for answering questions I had about the locations and conditions of some of his photos. I highly recommend checking out his blog. Great composition there Mark! A real pity that the lighting conditions were not favourable because the colours are indeed a little flat. Thanks for stopping by. Hopefully, I can get a better shot this winter or when the skies are less hazy. Thanks for taking the time to view my post and for taking the time to comment. It is a really nice shot. I can just make out the mountains in the back ground. I imagine it would be stunning without the haze obscuring them. On a side note, I have nominated you for the LIEBSTER Award. I hope your blog following grows because of it. Thanks for your comment and the award nomination Colin. Much appreciated. A polarizer generally helps reduce the haze by reducing light scatter. However, I was facing due east and the sun was setting almost directly behind me so it would have been of little help. I will definitely try this shot in the future. Phillips stuff is awesome. A really nice fellow too. If you check out his blog, he provides all sorts of information for his shots.